PennsylvAsia: Haikyuu!! The Movie: Battle of Concepts (ハイキュー!! コンセプトの戦い) in Pittsburgh, September 19 and 22. Haikyuu!! The Movie: Battle of Concepts (ハイキュー!! コンセプトの戦い) in Pittsburgh, September 19 and 22. The movie Haikyuu!! The Movie: Battle of Concepts (ハイキュー!! コンセプトの戦い) will play at Southside Works Cinema on September 19 and 22. 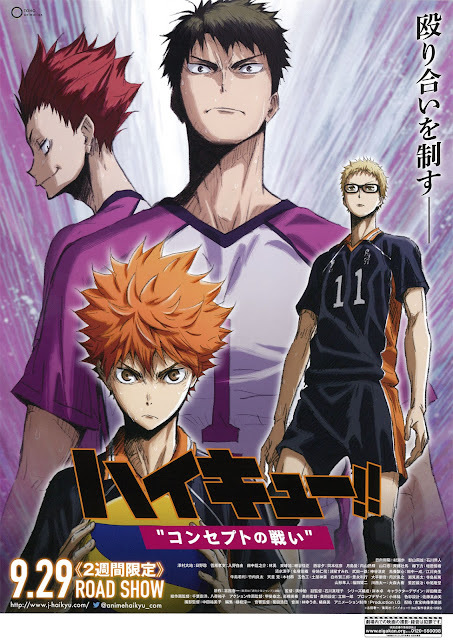 Based on the 3rd season of the popular TV anime series Haikyuu! !, the compilation film focuses on the Karasuno High Boys volleyball team preparing for their final face off to represent the prefecture in the volleyball national championship. Despite being known as "The Fallen Champions", Karasuno High boys volleyball team is highly determined to take down the powerhouse, Shiratorizawa High boys volleyball team. As Hinata comes closer to fulfilling his promise of defeating Ushijima's team, will the "Flightless Crows" finally find their wings and soar above the best school in the prefecture? The movie will play in Japanese with English subtitles, and tickets are available online. Southside Works Cinema is located at 425 Cinema Drive in the Southside, one block from the Hot Metal Bridge (map).